Minerals are absolutely essential for our body to function in a healthy manner. 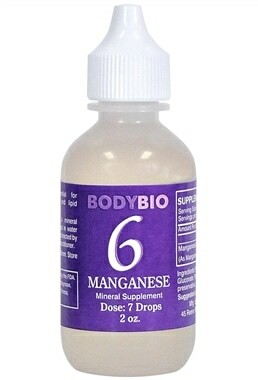 Manganese is essential for carbohydrate, bone and lipid metabolism. Purchase this product now and earn 2,151 Reward Points! Minerals are absolutely essential for our body to function in a healthy manner. 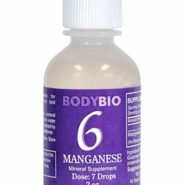 Manganese is essential for carbohydrate, bone and lipid metabolism. INGREDIENTS: Purified water, Manganese Gluconate, Potassium Iodide as a preservative. Suggested use: 7 drops per day. What are Liquid Minerals used for? Minerals are essential, but are depleted in most people, probably because of today’s over-fertilized, over-pesticized farming. Since heavy metals (“bad minerals”), such as Mercury, lead, cadmium, etc., are more prevalent in our society than ever before, it is believed that the intake of “good minerals” will help remove those toxins (“bad minerals”). One mineral can, and will, displace another with the same ionic value. By taking good minerals, we help displace bad minerals & mobilize them out of the body. It’s a double nutritional hit: adding needed minerals and detoxing at the same time. Why are your Liquid Minerals in liquid form? Minerals taken in liquid form are more readily absorbed in the body. Using the BodyBio Mineral Taste Test Kit gives you the ability to taste them and then take only the ones you need. Is the dosage listed on each bottle suitable for a child? Yes, however if the child is taking other supplements or medications, we recommend speaking with a health care practitioner. Since the dosage is measured in drops, the dosage is easily adjustable. Why do your Liquid Minerals need to be taken with Vitamin C? How much Vitamin C is needed? A pinch of Vitamin C is added to our Liquid Minerals because it helps to make the minerals more bio-available to the body. Are your liquid minerals Ionic or Colloidal? Why-what is the difference? E-Lyte Liquid minerals are ionic. Ionic minerals dissolve in aqueous solution (water), while colloidal minerals are suspended in aqueous solution. Are there any side effects from taking Liquid Minerals? None have ever been reported to us. Can your Liquid Minerals be taken on an empty stomach? They can be taken on an empty stomach.